Even after the Lion Air crash of its state-of-the-art MAX 8 in October, Boeing was predicting another banner year in 2019. Orders of its aircraft were up. It had notched three major Pentagon contracts. And its stock was flying sky high. But now, after another of the aviation giant’s workhorse jets crashed, this time in Ethiopia, killing all 157 people on board, it’s facing renewed questions about its safety and reliability as investors knocked back its share price more than 12 percent in early trading Monday. It recovered somewhat as morning trading went on. Boeing, which last year had carried the Dow Jones industrial average to record highs, dragged it down on Monday morning, as the blue-chip measure opened in the red. China, Indonesia and Ethiopia have grounded the 737 MAX 8 aircraft, which was involved in both crashes, and other carriers have signaled they may follow suit. The Chicago-based U.S. aerospace giant, with more than $100 billion in revenue and 153,000 employees, is one of the most heavily weighted of the Dow’s 30 components. It has been one of the drivers of the 10-year-old bull market; its stock had been up more than 30 percent, year to date, as of Friday’s close. The “decline is weighing heavily on the Dow because the stock has much more to surrender than other Dow components,” said Sam Stovall of CFRA Research. 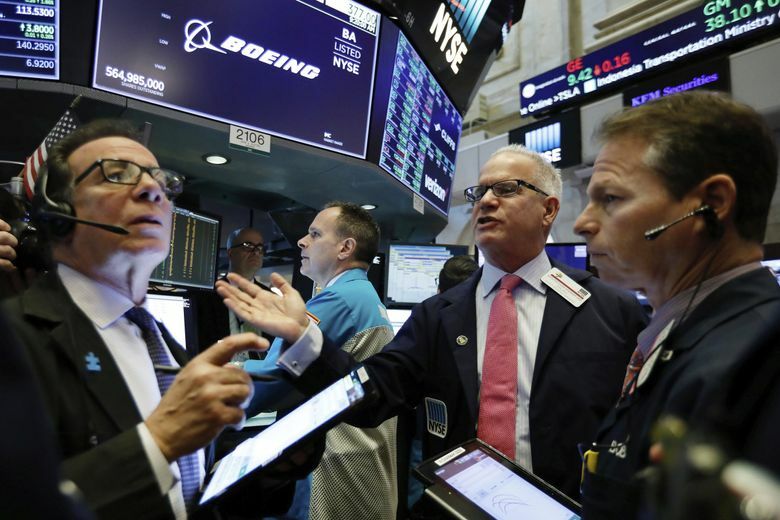 The Standard & Poor’s 500-stock index and the Nasdaq composite index showed slight gains in early trading Monday. Europe and Asia markets were also up, despite growing concerns over global growth spurred by a disappointing U.S. jobs report on Friday. The crash comes as the aerospace giant has been having a stellar year.While its commercial business has been surging, those three major military contracts totaled more than $18 billion combined to build training jets, replacement helicopters and drones that can refuel fighter jets in midair. Boeing is also building the next Air Force One, a spacecraft to ferry astronauts to the International Space Station and a monster rocket that NASA says will one day take them to the moon. In 2016, it celebrated its 100-year anniversary, a legacy that marches in lockstep with the history of American aviation, from dawn of commercial air travel in the years following the Wright Brothers to the bombers that helped to allies win World War II, to the F-18 Hornets and 747s in use today. Its commercial airliner business, however, has long been the driver, and international orders for Boeing’s commercial jets continued to climb, even after the crash in October. With a backlog of 5,900 airplane orders, valued at $412 billion, it predicted steady growth in 2019. It is not clear what caused Sunday’s crash of Ethiopian Airlines Flight 302 six minutes after takeoff. on Sunday. Data show the plane ascending, then descending. It then began another ascent, this time while accelerating at faster-than-usual takeoff speeds. The pilot asked to return to Addis Ababa because he was experiencing difficulties, authorities said. Though the investigation is still in the early stages, the similarities between the two crashes have prompted carriers around the world to take added precautions. China’s Civil Aviation Administration said it asked domestic carriers to temporarily ground all 737 Max 8 jets, potentially affecting hundreds of flights. Ethiopian Airlines said its fleet would be grounded as a precaution, as did carriers in Indonesia and India. Boeing said it was working with investigators in Ethiopia to understand the cause of the crash. In the United States, Southwest Airlines and American Airlines have 59 between their two fleets, with 304 on order. Southwest said it has been in touch with Boeing and plans to follow the investigation. It had not made any changes to its operations or inspection protocol as of Sunday, the airline said. American Airlines said it was monitoring the investigation but remained confident in the safety of its aircraft. While Boeing’s commercial business has long driven the company’s revenues and stock price, it has also focused on transforming its defense business under the leadership of Leanne Caret, who was brought in to lead the division in 2016. She was brought in after a Boeing and Lockheed Martin team had lost a high-stakes contract to Northrop Grumman to build a new stealth bomber for the Pentagon. But since then, the company has had some notable successes, such as the Pentagon contract wins, which came over rivals such as Lockheed Martin. The company was criticized as bidding too low in an effort to unseat competitors, but executives said in late October that those three combined opportunities would eventually rake in up to $60 billion over the next several decades. “Think of these as investments that enable a production run that begins in the early 2020s and will extend literally for decades,” Muilenburg, Boeing’s CEO, told investors at the time.